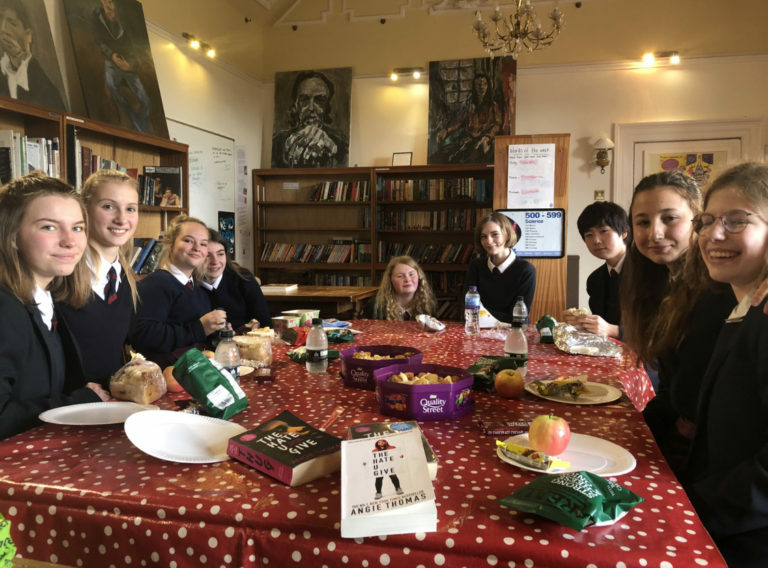 We held this half term’s book club meeting recently, and this month the book under discussion was “The Hate U Give” (colloquially referred to with the acronym “T.H.U.G” in its marketing and blurb), written by Angie Thomas. It is a ‘coming of age’ story that tackles life and death issues facing black teenagers, including race relations, interacting with the police, and fighting stereotypes. This is Thomas’ debut novel, but it has certainly made a large impression, selling more than 300,000 copies since its publication in 2017 and staying top of the New York Bestseller charts for nearly 2 years. Thomas’s skill and page-turning prose has resulted in a series of dazzling and impressive accolades that most writers of first time novels only dream of: the 2018 William C. Morris Award, the 2018 Waterstones Children’s Book Prize, winner of the Walter Dean Myers Grant, awarded by We Need Diverse Books, and being long listed for the National Book Awards for Young People and the Carnegie Awards to name just a few. So, lots of people clearly love this book – but more importantly … what did our Fyling Hall Senior Book Club think of it? Those that stuck with the American teen vernacular that Thomas used to bring to life the inner monologue of the sassy, intelligent and likeable main character “Star”, loved it. One of our club members commented that it had “taught her a lot about black experiences of teenagers in America” and had opened her eyes to the “brutal realities “of living in a prejudiced world. Most were quite shocked that even today, racial prejudice is ever present in the police force and were even more shocked when they discovered that Thomas was inspired to write the novel by real life events that are close to her heart. Overall, our students agreed that it was an excellent story, and some said that they had read it within a couple of days as they were unable to put it down. Everyone liked the hero – “Star” – and found her relationship with the other characters entertaining, as well as tragic. “It was pretty dark but it still made me laugh a few times which I liked” said another of our book club attendees. In particular, the complex relationship that she had with her white friends struck a chord with one of our students and it instigated a discussion about what ‘racism’ actually looks like in real terms. Is it just abusive language and violent attacks on people who have a different skin colour to you, or is it much more subtle than this? We all agreed that Star’s best friend (Hailey Grant) a privileged white girl from Williamson, was in fact blinkered and prejudiced to the core, despite proclaiming that Star was her friend and not behaving overtly like what they thought was a ‘racist’. I think that this is one of the reasons why I love this book: I could see that the novel had shifted perspectives and challenged some of our pupils’ more comfortable and naïve views on life. Exactly what education should try to do. It was also a riveting read. The fact that the 10 copies I bought for the English department have now been reissued to another 10 students in the school, perfectly reflects the brilliance of Thomas’ novel. The next novel that was chosen by Anais, one of our Y11 international students, is “The Perks of Being a Wallflower” by Stephen Chbosky. Any student who would like to join us for our next Book Club meeting should try to read the novel before our next meeting, which will be held on Friday 1st March in the library at lunch time.